With the present interest in fuel cells — devices for directly generating electricity by chemically combining a fuel and oxygen — it is possible to forget that this technology goes back a long way. The first known example was the “gas battery,” invented by William Robert Grove in the mid-19th century. But perhaps the most interesting figure to pioneer fuel cell technology in the early to mid-twentieth century was Francis Thomas Bacon. Francis Thomas Bacon was a forerunner in fuel cell technology. A descendant of the famous early modern English philosopher and champion of science Francis Bacon, F.T. Bacon was born in Billericay, UK, on 21 December 1904. Trained as an engineer at Trinity College, Cambridge, and employed by steam turbine builder C.A. Parsons in the 1930s, Bacon was fascinated by the ability of fuel cells to directly convert chemical into electrical energy. Although they were then considered a mere scientific curiosity, he became convinced of their usefulness. Experimenting on his own time, Bacon sought a simple, economical operating system. He envisioned an alkaline electrolyte design consuming pure hydrogen and oxygen, and operating at high pressure and temperature, allowing the use of inexpensive nickel as the catalyst in place of costly noble metals. Over the next three decades, Bacon focused on developing this design. 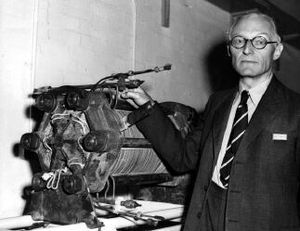 Between 1932 and 1941, he worked alone in the tradition of the amateur inventor, valuing technological experimentation over the search for fundamental physical principles. From 1941 to 1961, aided by an inheritance that enabled him to devote all his time to his project, Bacon organized several inter-disciplinary research teams in Britain, supported variously by the engineer Charles Merz, the Electrical Research Association, and the National Research and Development Corporation. During this period, the “Bacon Cell” emerged as a benchmark of fuel cell technology, with a six kW version demonstrated in 1959. Pratt and Whitney subsequently licensed the design to power the Apollo space vehicle, an improved version of which supplies electricity for the Space Shuttle. Though the “Bacon Cell” found no niche outside space application, owing to its requirement for pure hydrogen and oxygen, its success in that role served as a technological exemplar in the post-war period. The Bacon Cell inspired research on many other fuel cell operating systems. Living to the age of 87 (he died 24 May 1992), Bacon became well respected, and also witnessed renewed interest in his invention.